5/21: Huge, open kitchen with plenty of seating. 8/21: Separate breakfast nook off the kitchen. 9/21: Convenient main floor laundry room with a sink. 15/21: Bunk room, 3rd floor, a pair of full-over-full bunks for up to 8 kids. 19/21: Jack-and-Jill bath between the two 1st floor king bedrooms. This is a great home for 4 beach-loving couples with children, or up to 12 adults max. Sleeps 16. If this home is booked for your dates, be sure to see our other 5-bedroom beachfront home nearby - same incredible views and new decor! See our listing for The Land of "Ahhhs!". No need to ask how far to the beach – this home is ON THE BEACH! You can enjoy incredible panoramic ocean views throughout this home, step out onto any of the 3 massive decks to hear the waves and see for miles down the beautiful white sand beaches – or better yet, put your toes in the sand – right outside the door of this amazing vacation home. This beautiful, custom-built home sleeps up to 16 beach lovers in 5 BEDROOMS (4 KINGS and 1 BUNK ROOM with 2 full-over-full bunk bed (yes, that’s 4 full-size beds) and 3-1/2 BATHROOMS. With full-length decks facing the ocean, you are always just a few steps from what you came to enjoy! With private access to the first level deck (closest to the beach), this bedroom features a comfortable KING BED, flat screen TV, and custom closet. Wake up to ocean views – and step out into the sand whenever you want! This room shares a Jack-and-Jill bathroom with the other King Bedroom on this floor. This large bedroom features a KING BED with 2 nightstands and reading lamps. There’s a flat-screen TV, and a dresser and double closet for convenient storage. You’ll appreciate the incredible beach views from the double doors that open directly onto the beautiful deck. This room shares a Jack-and-Jill bathroom with the other King Bedroom on this floor. This spacious bathroom between the 2 bedrooms on the ground floor features a large granite vanity with 2 sinks, a commode and a tub/shower combination. Incredible ocean views fill the windows of the comfortable living/dining area, which features original hardwood floors, a fireplace, plenty of seating, a large, flat-screen TV and dining space for 8. There’s additional seating at the huge 12-foot bar. There’s also a breakfast table with 4 chairs on the opposite side of the spacious kitchen. There’s plenty of room for several cooks in the incredible kitchen which is open to the living/dining areas – so you can cook and still enjoy the amazing view! This space has an abundance of cabinets and granite counters all around, a double-wide refrigerator with bottom freezer drawer, deep double sinks, dishwasher and microwave. You’ll find all the dishes, pans and utensils you may need, a coffee maker, toaster, blender and even a few spices, to get you started. This lovely bathroom features a commode and pedestal sink. It’s conveniently located off of the main living area. This laundry room features a full-size washer & dryer, as well as a deep laundry sink. You’ll find the iron, ironing board and vacuum here too. A beautiful KING BED is the centerpiece of this private retreat – and you can enjoy the stunning view from anywhere in this room or step out onto your massive private deck facing the beach! This beautiful room features new tile floors, a fireplace, a lovely rattan chair, 2 nightstands with lamps, a flat-screen TV and a huge walk-in closet. If you'd like to sleep late or enjoy a nap while on vacation, pull the brand new black-out curtains closed and relax. There is also a stunning ensuite bathroom. This large, light-filled room features beautiful 18” tile floors, 2 separate granite vanities with storage, a beautiful glass shower and an incredible stand-alone soaker tub with center faucet. There’s another door to the deck from this room. Children are going to love this great bunk room! There are 2 full-over-full bunk beds (yes, that's 4 full-size beds), room for 8 children or 4 adults. You’ll find a dresser, flat screen TV and closet as well. This room shares Bathroom #4 with the King Bedroom next door. This bedroom features a KING BED and a flat-screen TV. Two windows bring in plenty of light, and there are blinds and curtains if you'd like to sleep in. There’s also a nice closet for storage, and guests in this room share large hallway bathroom with the bunk room. This large bathroom features a beautiful granite top vanity with a double sink, commode and a huge garden tub/shower combination. You’ll be right on the beach…and on Scenic 98 in Miramar Beach. You can walk to several nearby retail shops and restaurants. You will also have easy access to shopping, restaurants and activities like Destin Commons, a beautiful upscale shopping and entertainment center. It features over 75 shops and restaurants, including Bass Pro Shop, World of Beer, Panera Bread, Uncle Buck's Fish Bowl & Grill, AMC Theater with IMAX and much more. Beach activities vendors are nearby – Jet Ski, paddle-boarding, para-sailing, etc. The Silver Sands Outlet mall is not far for those who enjoy “retail therapy”! We are pet friendly and welcome your dogs in our home. Pre-approval and a $200 + tax pet fee apply. We will greet you when you arrive and will be here should you need us during your stay. This home is always clean, the linens will always be nice and fresh, and everything is impeccably maintained. You don’t have to worry about finding a home that's less than advertised. We want our guests to walk into an exceptional home and immediately feel comfortable and relaxed. We know how difficult it is to find a vacation rental to suit your family’s needs, schedules and budget. We’re happy to assist you with the process of finding and booking the right place to stay for your vacation. We don’t leave you hanging—we actually answer our phone and do our best to get back to all email inquiries within an hour (and if you put your phone number into the inquiry form, we will call you)! Unlike many other people who never update their calendars, we always keep ours up-to-date. If this property is booked, be sure to check our other properties by using the Search function on the top left area of this page. 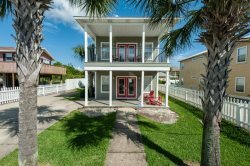 Beachfront: Our home is directly gulf front, no streets to cross, just down the steps off our deck, directly onto the white sand beaches! Dishes & Utensils: stocked and ready for the chef! Stove: electric, full size and nice! Deck / Patio: 6 decks and patios!